The film is directed by Damien Chazelle of “La La Land,” and nobody would ever accuse him of sitting back on his laurels. He has taken his time as an artist to pursue different genres of storytelling, and “First Man” is a based-on-history drama of high order. The slowly paced film breaks down the pursuit to get to the moon… part geopolitics, part discovery and all adventure. 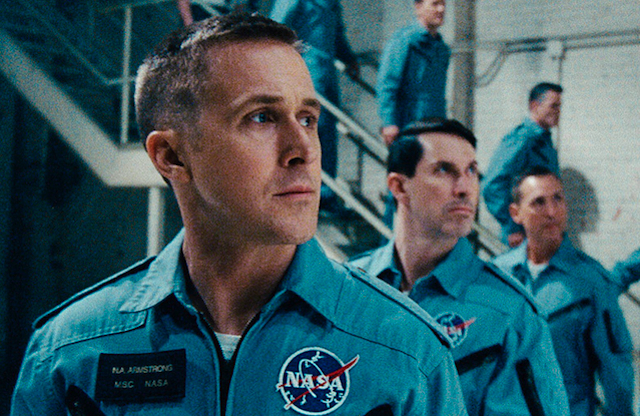 Neil Armstrong was a famously reticent man, and actor Ryan Gosling is perfect to interpret that part of him. The actor’s infamous stone face is super-astronaut appropriate, but he also reaches the human side of the American moon hero. For persons who remember this magic moment in U.S. history, the film brings it back emotionally, and not without a tinge of regret for not ever having gone back after 1972, the last journey there. Neil Armstrong (Ryan Gosling) is a test pilot in the early 1960s, pushing new aircraft to the limits under Chuck “The Right Stuff” Yeager. When a position opens up at NASA to be part of the ramp up to the Apollo moon missions, Armstrong signs up. This means uprooting his wife (Claire Foy) and family, still mourning the untimely death of their toddler daughter. He joins his fellow astronauts, and most of them living in the same neighborhood. Ed White (Jason Clarke), Jim Lovell (Pablo Schreiber) and Pete Conrad (Ethan Embry) are overseen at NASA by Deke Slayton (Kyle Chandler), among others, and over the years the difficulties of sending human beings to another spheroid through space looked impossible. As Armstrong’s team is gathered for the historic journey, including Buzz Aldrin (Corey Stoll), the lunar surface beckons. Getting to the actual moon landing was a bit slow, and the angle of the daughter’s passing a bit overwrought, but the build-up does serve as an emotional connection to actually feeling the big event again. That feeling deepens if you can remember the actual time (50 years ago next year) and the hopefulness of a nation and world trying to heal from the chaos of the 1960s. If you were there at the moment, the re-creation takes on a religion-like quality, and director Chazelle gives it the right… touch. Credit also goes to Gosling, whose actor persona includes a reluctance to emote with expression, and for using that part of himself to full extent in portraying Neil Armstrong. The astronaut was not a flamboyant man within any description, and combined with his background in mechanical engineering, the actor’s challenge was to reach beyond the silent and accountant-like demeanor… which was nicely accomplished by Gosling. He obviously understands the need to not wear any emotions on a spacesuit sleeve, but he gives Armstrong enough of an inner life to get his feelings to the moon and back. The astronaut program is those days were a “boys only” only club, and most of the spacemen and their support engineers had been tempered by World War II and the 1950s Korean War. This meant many crew cuts and somber head shaking, as Chazelle tries to get a social handle on the era as well. 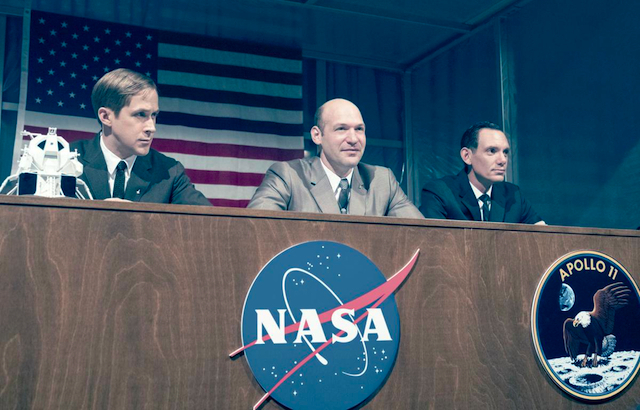 Most of the supporting actors were cast in this light, but the underrated Corey Stoll is a hoot as the unpredictable Buzz Aldrin, injecting some salacious life into the hard knocks of this serious undertaking. “Tranquility base here, the Eagle has landed,” were the words everyone wanted to hear during that July of 1969. Human evolution had achieved the unthinkable, just one hundred years after the horse and buggy. That “small step” and “giant leap” will never lose its power to thrill for certain generations, and “First Man” brings it all back.